Note: This story was published on 12 September 2015. 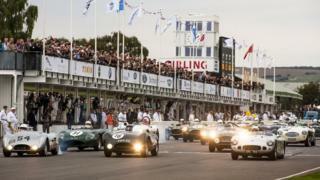 The "world's largest" historic motor racing festival has been thrilling a sell-out crowd of 150,000 in West Sussex. Most have been in period dress at the Goodwood Circuit, near Chichester. The parades and races aim to create a "magical step back in time celebrating the halcyon days of motor racing", said the organisers. The annual event has run since 1998 when Lord March revived the circuit, which closed for racing in 1966. Goodwood said star drivers this year include Tom Kristensen, the most successful driver in Le Mans history with nine wins, and fellow world champions on four wheels and two Andy Priaulx, Kevin Schwantz and Freddie Spencer. Celebrities Theo Paphitis, Chris Rea and James Martin are racing while Take That's Howard Donald has also entered a car. Meanwhile, the life of McLaren founder Bruce McLaren is being celebrated with a parade each day of 30 cars from his career. The festival will also be marking the 75th anniversary of the Battle of Britain with Spitfires, Hurricanes and the only flying Bristol Blenheim in the world.